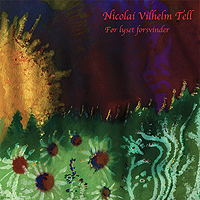 Nikolai, this is his first solo LP and takes you back to late 60’s with the cool organ sound and laid back vibe of the tunes. Some might remember Nikolai as the organ player in the short lived Danish band, Ghost Rocket. All the music is played by himself and Carsten Svendsen. It was recorded between 2002 and 2006. The record begins with Sov Sødt (and you can hear his son in the background). This is a long and beautiful track with a real late 60’s sound and feel. The organ is really great and gives you a taste of what will follow. Question No. 4 begins quite psychedelic and sounds a lot like Syd Barrett era Pink Floyd. Troldmans Lærling is a melodic instrumental track with great organ playing. Side A ends with Trippet which has some highly effected guitar and takes you back to the time of psychedelic rock in the late 60s. Side B starts with the instrumental title track and is slow and spacey and probably my favourite track on the record. It is quite repetitive but it really sucked me. Psychic Landscapes is a very short track and sounds like a piece of a cool jam. Too bad we don’t hear the rest. Det psychedeliske træ again will remind you of old Syd Barrett stuff. The LP ends with Pigen I Engen. Another beautiful song. This is quite a nice record. Only available on vinyl..